With all the chatter about robotics, let me stress my credentials. I have a Masters in Robotics from Carnegie Mellon University. I focused on field robotics, with an office down the hall from Red Team Racing’s first DARPA Grand Challenge entrant. I did computer vision research, and worked on iRobot’s Urban Grand Challenge entrant. There are definitely new developments in the years since, but none change how to go about solving the problem. That is why DARPA moved on from automated driving: the next steps are about building product, not research. The first and most important guidance I can give is that you need to make a product people can use as fast as possible. There are many reasons for this, from the structural limits of the competition to the way the robots will actually get smarter. The easiest way to move faster is to do less. Make a car that only works in good daylight conditions, on roads that have clear lane markings, on a whitelist of major freeways, and in good weather conditions. Each of these changes dramatically simplify the problem. You’ll need to solve them eventually, but not immediately. This doesn’t really seem to be the approach Google is taking. They are holding back a car that seems remarkably performant. They are openly paranoid about what happens when the first robotic car kills someone. This is a sadistic thought because human driving kills 34,000 people yearly and automated driving is the only way to dramatically lower that number. Public perception and policy-maker overreaction are real concerns, but as a startup, you don’t need to be as concerned. Google is going to push through the regulatory changes required for the product you build. You need to leverage not being Google and be more aggressive with how fast you sell a product. To understand this, go back to Google. Not their cars, their search engine. Pagerank was an algorithmic advance, but the inclusion of a new data source, anchor text, also dramatically mattered. What’s more, Google’s position as a search leader is solidified because click data on search results is incredible for feedback to improve both the results and the algorithms that generate them. Algorithms do matter in robotics, but performance improves faster if you have more data. You need to be aggressive in how quickly you release a product in order to start getting this data from real usage. Get the product in the hands of real people because the marginal data that they send you will be worth much more than further testing on your end. It might even be worth selling sensor systems to put on cars just to be able to get more data. You’ll probably be iterating heavily on the hardware. 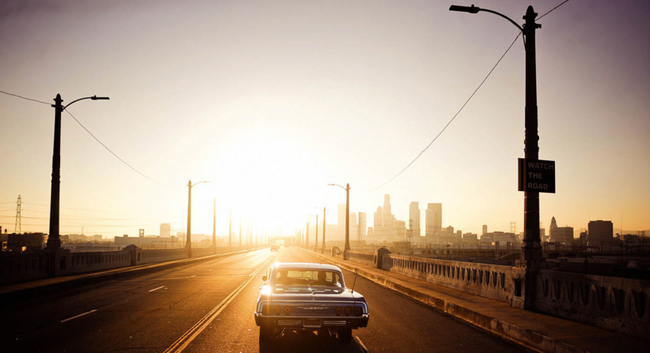 Consider leasing cars so that you can update them frequently. You can make the price tag pretty high too. Find people that get paid enough to spend $5K / month on a lease . If you do this in Silicon Valley, there are ample rich tech visionaries that would like the notoriety of being among the first to have a robotic car. They would also make great beta customers because of the safety issues: they need to be ready to support the industry even if they have an accident. What about everyone else? Like cell phones in the eighties, it is exactly when a technology is young that the only buyers are people that need it most and can afford it. Today billions of people have cellphones, and in the future every car is going to be autonomous. How do you know when you’ve done enough testing to launch a product. Let’s assume that you have an initial early adopter base that lets you expand testing. It occurred to me recently that there is a simple way to judge when you’re ready to sell to a broader market: be better than humans, but only just. How bad are humans? Exact statistics require more precise research, but every year there are trillions of human driving miles logged and millions of human caused accidents. This means you need to log approximately one million miles without an accident to be better than humans. If you have a fleet of 100 beta vehicles, driven 1000 miles a month, you can have a broad launch in 10 months. 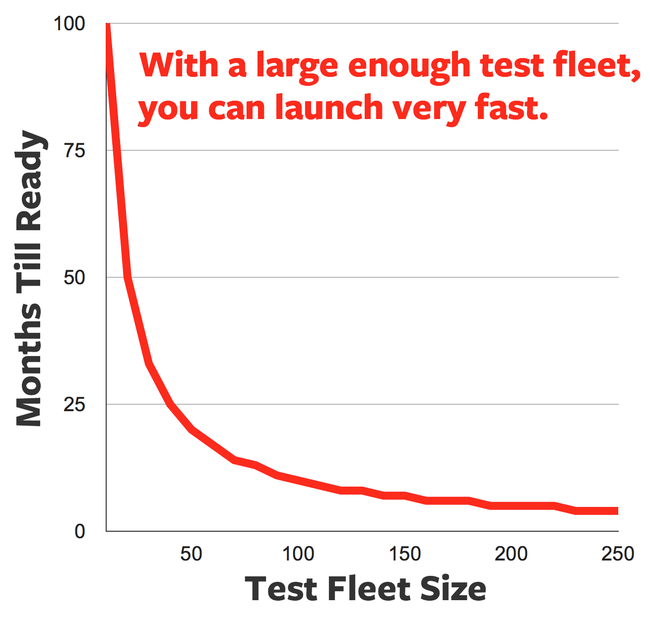 The larger your test fleet, the sooner you can have the data and the confidence to make a much broader launch. There are a few things I know you shouldn’t do. Don’t try to engineer the roads: the system should be self contained. This doesn’t mean it isn’t connected to the internet, just that you’ll need control over entire product, which means just the car. Don’t take any government funding. That will kill your development cycle, no matter how appealing those defense contracts look. Don’t worry about big car companies: they tend to move very slowly. Ignore your competition, except in lighting a fire within your company to make you most faster. Don’t worry too much about policy: your standards are going to be high enough to set the bar for products on the market. I wrote a draft for this post a while back, but I recently learned a friend is actually working on the problem. I am incredibly confident about his team and their approach. They have some really novel ideas I excluded from this post. I was so impressed in fact, that I made my first angel investment ever in the company. If you’re an investor and in the next few weeks you don’t meet with a robotic car startup, you’re missing out on an incredibly opportunity. Some estimate trillions of dollars saved yearly just in the US when cars become autonomous. Sometimes a research robot goes wild in a very glitchy way. It might suddenly jerk to the side and speed off. This is often caused by some edge case in the code or bad reaction to inputs. It’s called a “Crazy Ivan”, named after the tactics Russian nuclear submarines would take to evade American subs and their sonar monitors who assumed a reasonable navigation. Suffice it to say your robot car shouldn’t have any Crazy Ivans. If you add 1.5 productive hours daily, 20 days monthly, then it means a $5K / month lease is worth spending if you earn more than around $150 / hour. This means there are more people that should buy a robot car than you might think. I’m giving away my startup ideas because I’m focused on building my new startup, YesGraph. We help scale viral growth, so if you like this post go try YesGraph!